Rock avalanches are studied at the Laboratory for Rock Mechanics of EPF Lausanne by means of unconstrained flow experiments of dry granular material. Tests aim at studying the influence of different parameters on the propagation and deposition mechanisms as well as on the characteristics of the final deposit. The existing measurement system, based on the fringe projection method, was improved in order to increase the quality and the reliability of the volume measurement and the computation of the centre of mass of the final deposit. The latest developments allow using this method to follow the mass during its motion. Additionally, a new technique that allows tracking the mass front was set up and compared to previous results gathered with the commercial software WINAnalyze. 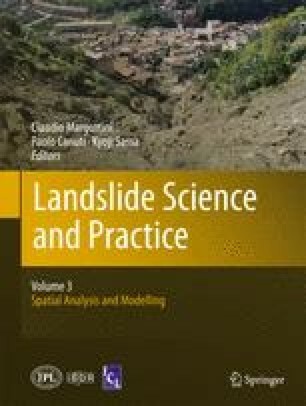 Results of experiments carried out with a gravel supposed to have the same characteristics as the one used in a previous research study Manzella (2008 Dry rock avalanche propagation: unconstrained flow experiments with granular materials and blocks at small scale. Ph.D. thesis 4032, Ecole Polytechnique Fédérale de Lausanne, Switzerland) showed some differences, suggesting that the grading of the material has a certain influence on the runout and the position of the centre of mass of the final deposit. A more significant difference is related to the state of the propagation surface. Recent experiments with a curved transition at the bottom of the slope and a larger volume lead to new results. Contrary to previous observations, for a given falling height of the source base, the distance travelled by the centre of mass on the horizontal panel increases with the volume. This leads to discuss further some conclusions previously drawn. The authors thank the Swiss National Science Foundation for funding this research project. Further acknowledgements go to Dr. Equis for his help in the improvement and extension of the measurement system, as well as for his careful review of the third part of this paper. M. Mattheeuws for proofreading this article. Jean-Marc Terraz, Laurent Morier, Michel Teuscher and Laurent Gastaldo for designing and modifying the experimental set-up. Thomas Badoz, Emilie Decrausaz, Mathilde Charrier, Gabriele Pisani, Bastien Ferrot and Laurent Gastaldo for their help during the experimental campaign.